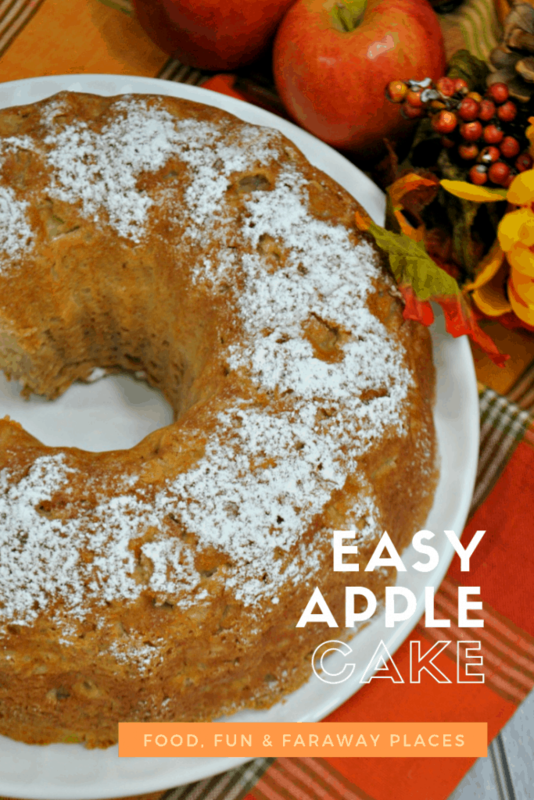 Easy Apple Cake is the Best Last Minute Dessert on the Planet! 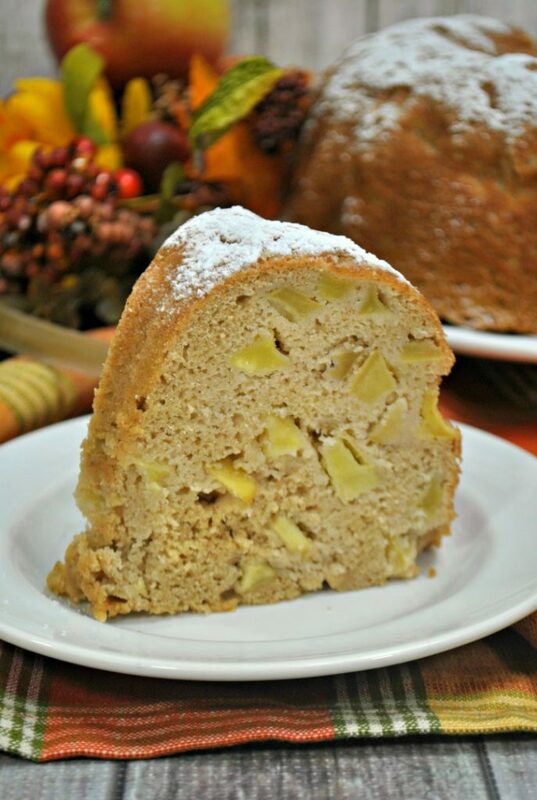 When it’s time to make dessert for a party or your family, this easy apple cake is the way to go. 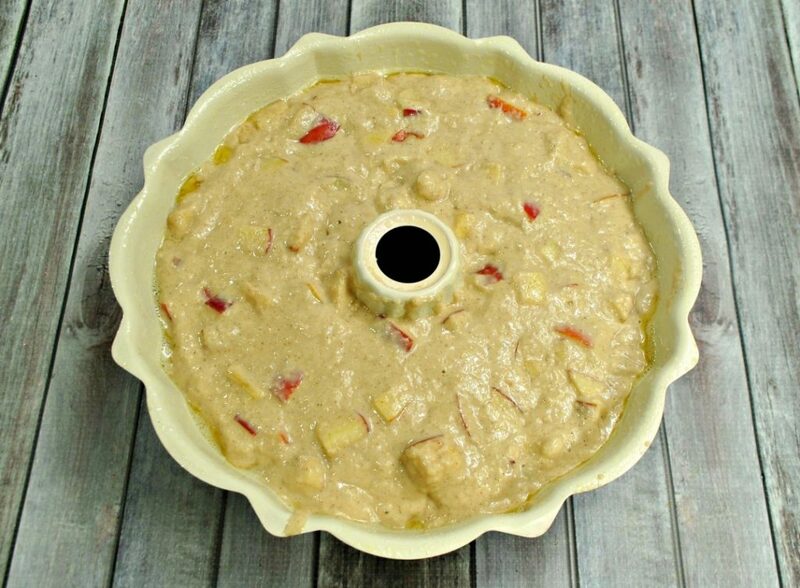 Everyone loves apple desserts, and you’ll love that this one is so simple to make. We always have apples in the fridge because they’re healthy and store so well. Did you know apples are high in fiber, vitamin C, and potassium? The rest of the ingredients are items we usually have on hand, so I can whip this easy apple cake up any day of the week. When unexpected company stops by for a visit, this is my go-to recipe. The best thing about this dessert is that it’s so moist, and seems to get even better the next day. In fact, this also goes well with a cup of coffee in the morning! 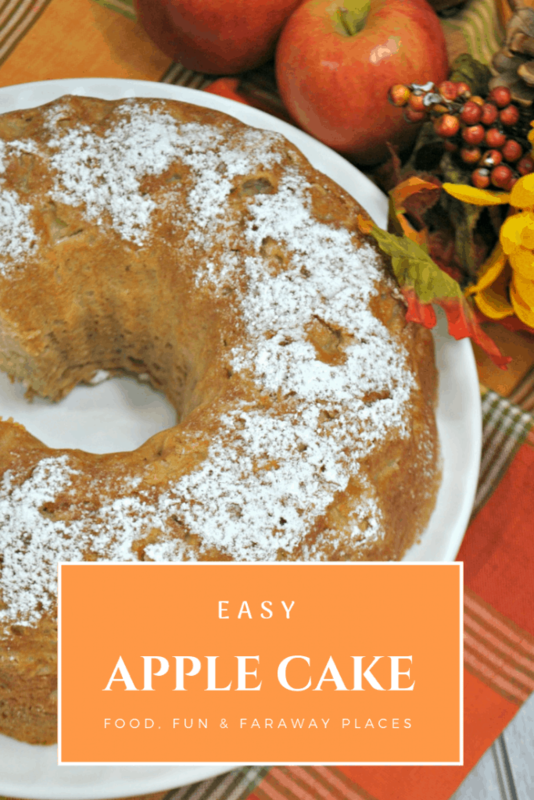 Sometimes I need a grab and go breakfast for my drive to the airport, and this easy apple cake is convenient and delicious. Heat oven to 350°. Peel and chop your apples and set to the side. Spray a bundt pan with non-stick baking spray. 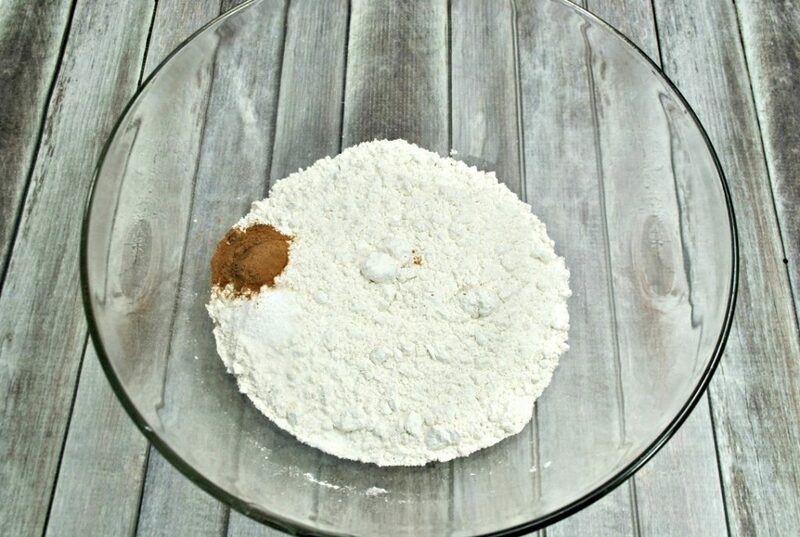 In a medium bowl, combine the flour, baking soda, pie spice, cinnamon, and salt. Add sugar and egg whites to bowl of a stand mixer with a whisk attached and beat on high until soft peaks form. Reduce the mixer to low speed, add in the apples, applesauce, and vanilla. Tap the pan on the counter to guarantee it is evenly spread. Insert a toothpick in the center to verify the toothpick comes out clean. Place the bundt pan on a cooling rack for 10 minutes. Sprinkle with powdered sugar. This dusting wand is my new favorite discovery. 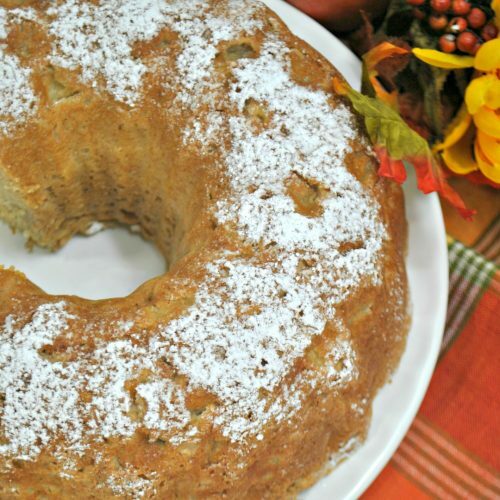 If you happen to be following the Weight Watchers program, this easy apple cake is just 7 Smartpoints, too. You can also freeze this cake and it will be just as delicious once it’s thawed. Looking for more Weight Watchers recipes? You’re going to love this roundup of Weight Watchers desserts, and you’ve got to try this Weight Watchers Apple Pie recipe. I think this makes such a pretty dessert, too. Bring your own colorful placemat for a beautiful presentation. Fall is the perfect time of year for apple picking. When we spend the day at the orchard, we usually end up with lots and lots of apples. If you’re in the same boat, I’ve got plenty of recipes to help you use them up! These apple spice scones are so delicious for breakfast and another easy grab and go treat. Speaking of breakfast, my kids love this homemade apple pie recipe I found from Emeril and tweaked just a bit for fewer calories. Love funnel cake? This apple funnel cake is also really delicious! Still want more apple recipes? These 21 apple recipes are sure to give you more favorites! Finally, this apple tarte tatin is from the Viking Cruise Line cookbook. We enjoyed the food so much on the Viking Rhine river cruise. 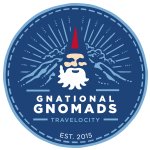 If you love to cruise, you’ve got to check out their many different routes on Viking River Cruises. 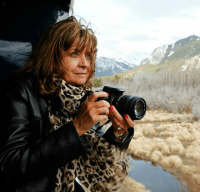 Connect with Food, Fun & Faraway Places on Social Media! 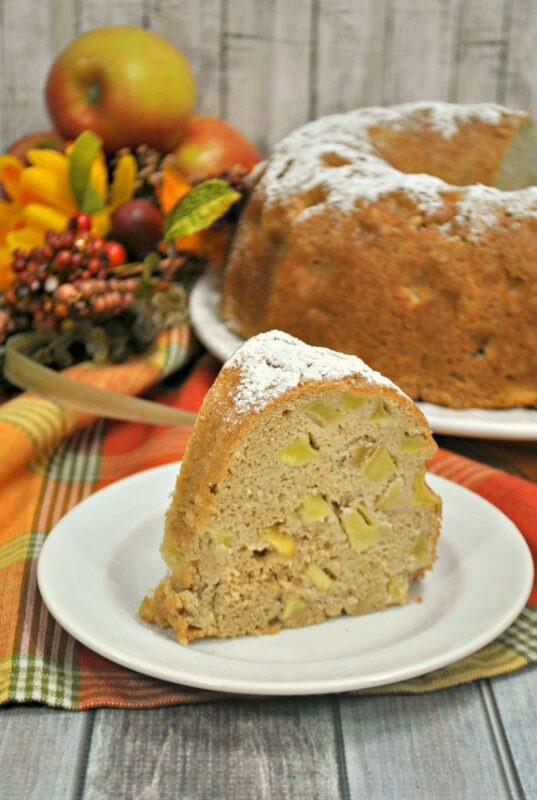 This easy apple cake will be your go-to for company or a special treat for your family. Prepare your apples and set to the side. In a bowl of a stand mixer with a whisk attached. Set mixer to high speed, beat the sugar and egg whites until soft peaks form. Add the flour mixture, stir until just combined. Tap the pan onto the counter to guarantee it is evenly spread. Serves 14. 7 Weight Watchers Smart Points.